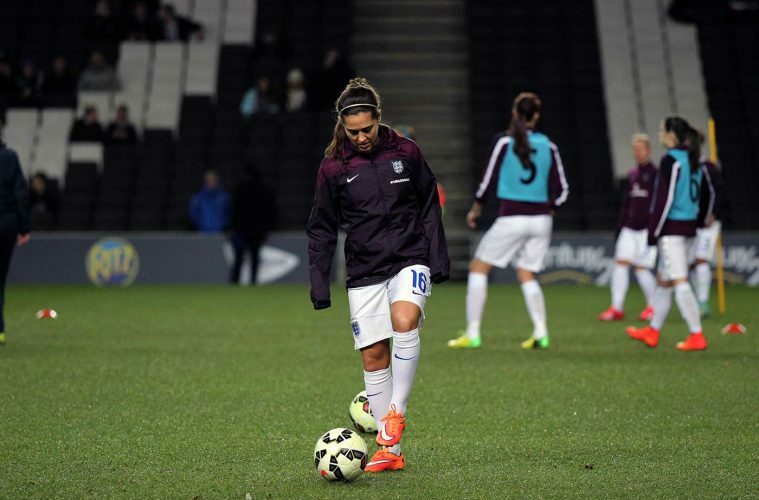 England’s all-time most capped footballer, Fara Williams, believes it’s getting harder and harder for young players to break into the Lionesses’ squad. The rise of professional football and a growing pool of talented England players has seen the competition places increase as the 34-year-old looks forward to another set of games 17 years after making her debut. “When I broke in at 17 or 18, it wasn’t professional,” said Williams. “The gap was really short between the teenagers and the senior players. Now the gap is harder for younger players because the seniors have been training full-time for a while. Among the jovial nature of her point, there’s definitely an element of seriousness to what Williams is saying. The Football Association announced a restructure last week which now sees the Under-20 and Under-23 national teams merge to create a new Under-21 side for the new batch of young players to train together as they prepare to make a play for the senior squad. With the likes of Aoife Mannion, Sophie Baggaley, and so on, still struggling to find the step up despite impressive form, Williams believes it’s still difficult for younger players to make that step up, but praises the current crop of players coming through in her position. The more immediate attention for Williams is on Saturday’s friendly against Brazil and Tuesday night’s game against Australia. Should Williams feature in both she would reach her 170th cap for England but given she’s played a supporting role under Phil Neville since what she describes as a “nightmare” performance against Germany in the SheBelieves Cup, she’s realistic about her chances. Williams is justifying her role in the squad thanks to her club, Reading, which she joined at the start of the 2017–2018 season. After a difficult period at Arsenal, Williams joined the Royals after the European Championships and has been in stellar form playing back further up the pitch, regular contributing goals and assists and she sees no reason why she can’t still play a role in the squad despite her age. With England set to come up against players like recently crowned FIFA Women’s Player of 2018 Marta and an ever-improving Australia side, Williams believes England still lack in overall technical ability compared to some of their rivals. And the midfielder says England have to treat both games seriously despite their friendly status if they want to be the best prepared they can be for the upcoming World Cup in France next summer. It will be the first major test England have had against top-ranked nations since the SheBelieves Cup in February and Williams is expecting two similar tests. “I think they’re both quite similar actually” she said. “Both hard-working, maybe the Australians harder working, but both have brilliant individual skills in the team and we haven’t played opposition like this for a while. These are the teams we need to play to see where we’re at and see if we actually can compete with the best.